"Good grief, they bury their dead above ground!" 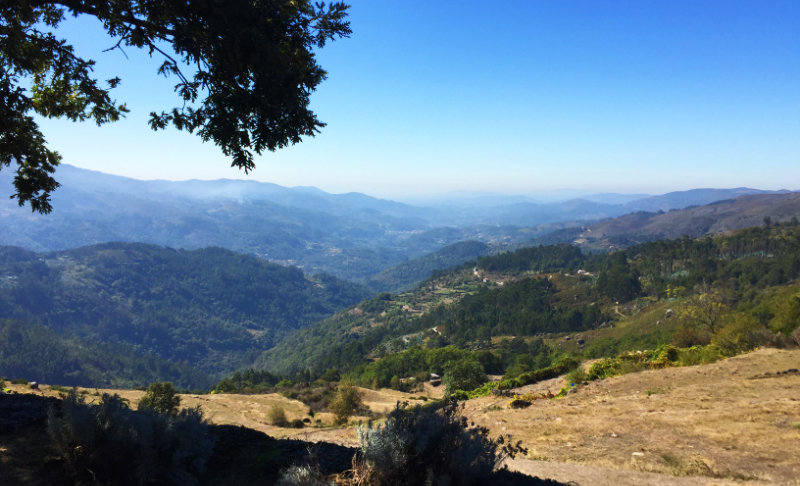 That was my first thought years ago when I took a bus into the old village of Soajo, which is set amongst the granite peaks of the Peneda Geres National Park. Well look at them! What would you think? Fear not, though. I'm not going to tell you ghoulish tales of gruesome customs. There are no walking dead in Soajo. In fact it's rather the opposite. 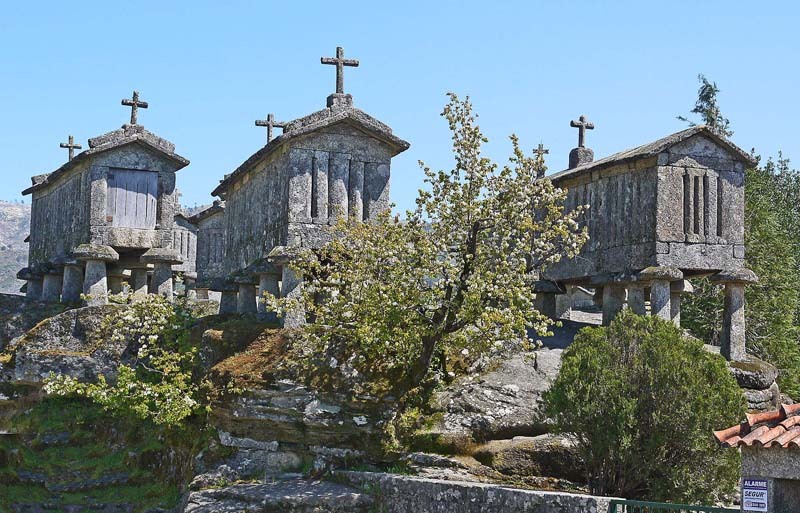 Despite so much of the land consisting of rock too hard to dig for graves, not to mention the tomblike appearance of these granite boxes topped with crosses, they are not in fact sarcophagi. There are no whitening bones of well-to-do Soajans inside; instead there are 'espigas', maize cobs. 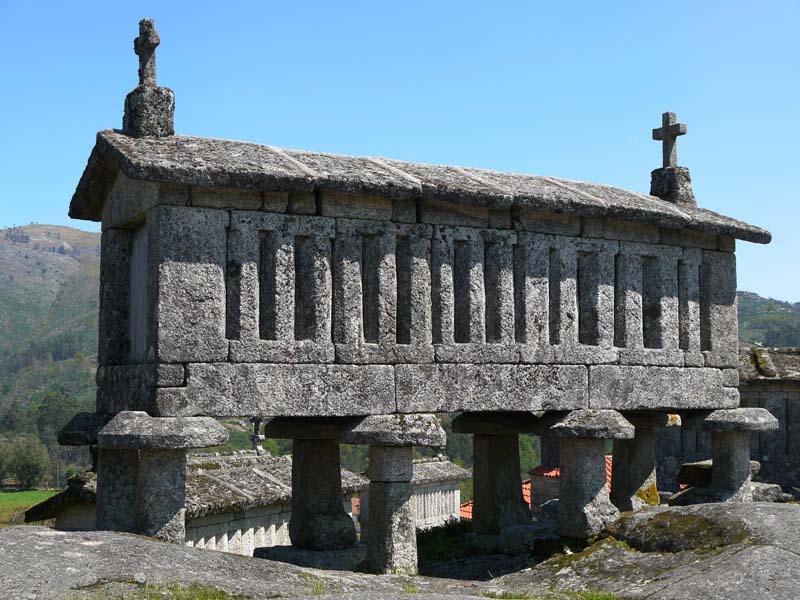 These granite boxes are called 'espigueiros', which means granaries for maize cobs. Far from symbols of death, these structures represent life, the staff of life in fact: bread. Look carefully around the Minho and you will see on estates and farms single espigueiros. Most commonly they are made from wood or have granite legs and corner posts filled in with slats of wood, both of which look much less like coffins. 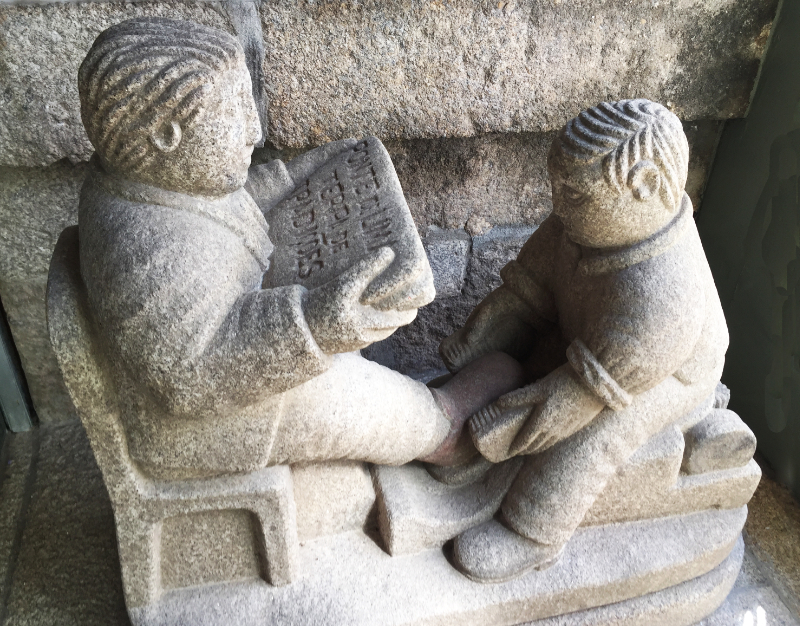 The startling thing about the ones in Soajo – and those in the Village of Lindoso, not far away on the southern side of the Lima River – is that they are wholly made of stone and clustered together as though in a cemetery. The reason for this clustering is that in the central area of these villages is an 'eira', a communal threshing floor on a flat slab of granite. The granaries were placed conveniently nearby. If you look closer you can see how they work. Along the sides are narrow slits, too small for any creature bent on 'burglary' but enough to help the espigas dry out and remain well aired to prevent mould forming. The container is supported on granite pillars, again to stop damp or rodents infiltrating. These are topped by staddle stones, the mushroom shaped tops, which are said to be difficult for rats and mice to negotiate. Sometimes the pillars are also set in small recesses which can be filled with water to deter ants. 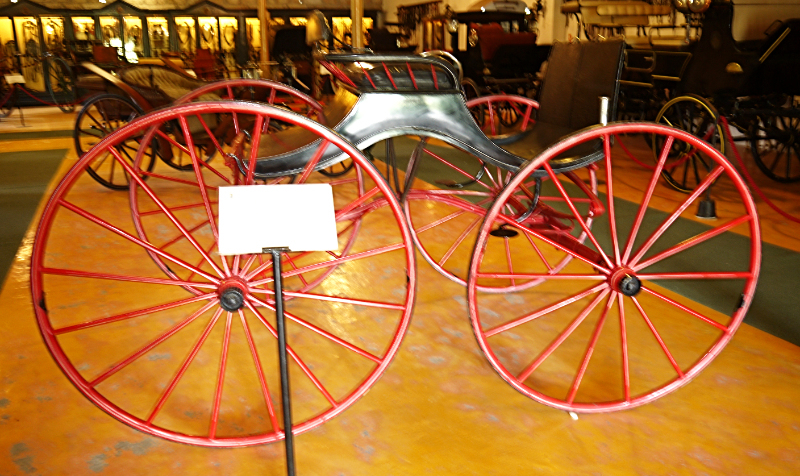 Many of the espigueiros date back to the 18th century. 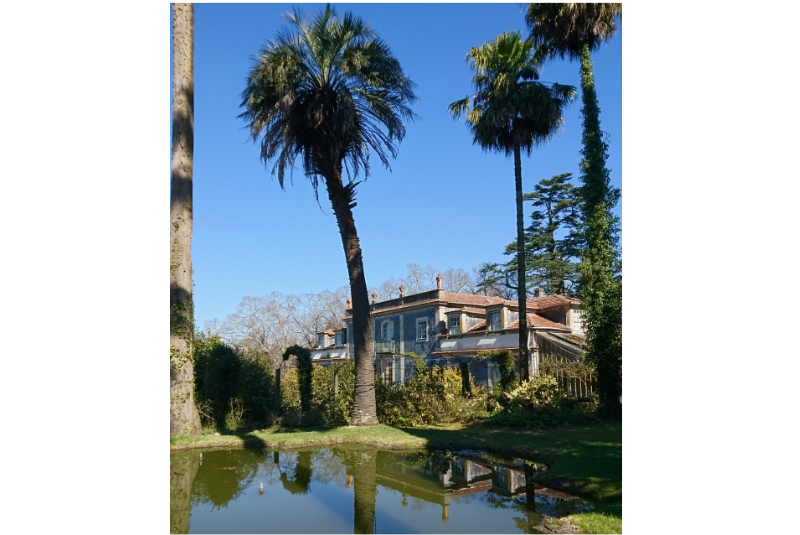 Indeed they are now recognised as part of Portugal's national heritage; we would say that they are listed buildings. Their antiquity, I think, explains in part the crosses on top. Portugal is still a religious country but back then, who or what would protect the crops from destruction if not God? The crosses are an expression of piety in a land where many went hungry in the winter, which can be bitter in those high hills. (When I first went to Portugal, though short by British standards, I was of average height; in rural areas I even seemed tall. Now the Portuguese are so much better nourished that the average height has increased markedly. I am now small there, just as I am in England.) In the 18th century, maize cobs together with other grains and provisions needed all the protection they could get. 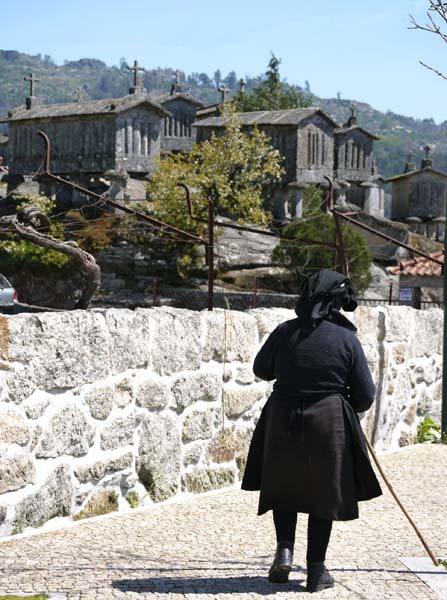 Even today some small, traditional old folk can be seen in Soajo. Here is one, perhaps going to inspect her espigueiro. Though there's no one young with whom to compare her, I think you can see that this lady is petite. Similar structures to the Portuguese espigueiro can be seen beyond Portugal's borders. In parts of Spain, principally Galicia and Asturias, they are known as hόrreos .... and taking a slightly different form but using the same principle they could in the past even be found in Britain. If you go to the Weald and Downland Open Air Museum in West Sussex you can find an example of a brick granary, supported on rock pillars topped by staddle stones, which was built in 1731, a similar period from which the oldest Portuguese ones are thought to date. 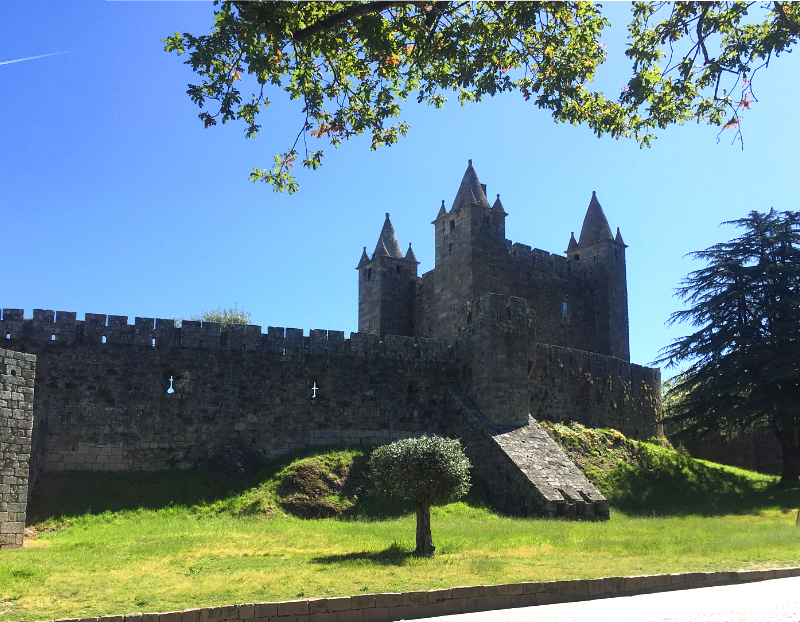 Have you been puzzled by something you have seen in Portugal? Write in and tell us about it.